I am always on the hunt for a quick takeout lunch near Wenceslas Square. I don't do fast food like McDonalds or KFC. But I do need my food fast. I have a rather encyclopedic knowledge of the area's options and can tick off the pros and cons of a myriad of choices. 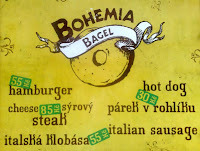 Recently, I've been going often again to Bohemia Bagel Express at Tylovo námestí, near I.P Pavlova tram and metro stops. I wrote a post more than a year ago about some of the bagel sandwich options from this unassuming little shack. My views on those still hold. They do a nice chicken salad with sun-dried tomato and red onion. But in recent days, I've been going deeper into the menu and, with a few caveats, I've liked what I've found. I've really gotten into their Philly cheese steak sandwich. 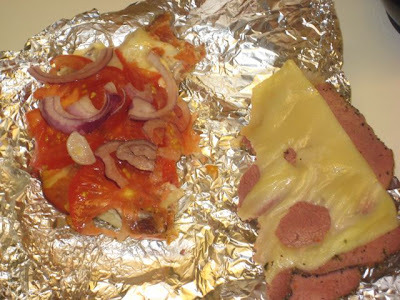 They used good quality beef, fried on an electric grill, along with onions and green peppers and the cheese melted into the large, toasted roll. The only issues were that the bun is too spongy and chewy, and I'd like it more if the onions and peppers were cooked longer. The peppers had too much crunch for my taste. But if you want your food fast but also cooked to order, concessions must be made. I thought it was a good deal at 85 CZK. They also offered a double meat version for 145 CZK. I tried that once, but really, the single was enough unless you are very hungry. I also really liked their bacon cheeseburger. It was nothing super special, but it hit a lot of the right notes. The beef patty was not especially thick, but still substantial enough that one satisfied me for lunch. It gets some decent flavor from the grill. It had a big bun that held together well. The price of 65 CZK made it taste even better, especially considering the skyrocketing prices of other burgers in Prague. They also had a burger without bacon or cheese for 55 CZK. Nice. This may sound like a strange complaint, but I thought it had too many toppings. They were all appropriate -- lettuce, tomato, and onions. But I always got way to much lettuce, and even the number of tomato slices were over the top. And sometimes they were on the bottom. 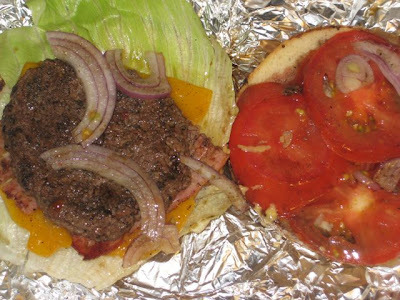 Once, there were tomatoes on the top and the bottom of the patty. The bun was also too chewy for me. Now, a word about the service from the folks behind the window. Not so good. I put the phone number for Bohemia Bagel Express into my phone so I could call ahead and save time. I called ahead for a burger. The woman asked me, in Czech, what kind of bagel I wanted it on. I said I didn't want a bagel, I wanted a hamburger bun. Conversation ends. I get back to the office and, lo and behold, my burger was on a bagel. Perhaps I didn't understand every word she said. But I clearly said what kind of bread I wanted. At least she chose sesame for me. Not a bad choice. Here's a look inside. There was a lot going on in there. Which was a particular problem when served with a bagel because everything shifted around and fell out more easily. 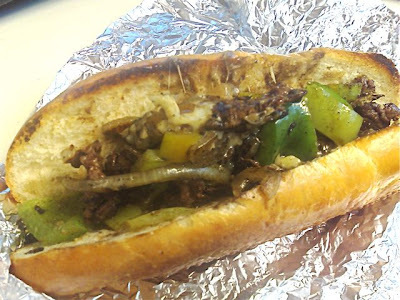 Example #2: I once asked for a little ketchup on my cheese steak (yes, it's true). When I unwrapped my sandwich at the office, there was no ketchup. But that miscommunication pales in comparison to another one I had with them. Again, I ordered a burger over the phone. I was in a big hurry to meet someone for a ride out of town. Plus, it was raining, and I had no umbrella. Plus, I was starving. Warning: I'm dangerous when I am hungry, late, and wet. I got to the window as the person ahead of me got his food and walked away. I asked for my order and by the look on the two faces in there, I knew immediately what had happened. "You gave my burger to that guy!" I had murder in my eyes. "WHY DID YOU DO THAT!!!" "He ordered the same thing! We didn't know it wasn't you." the woman said. "Sorry! Sorry! Sorry!" She said in Czech that he also called, indicating that was why they were confused. But I could see the grill. There was no other food cooking. "Then why isn't there another hamburger cooking?!?" I was getting ready to lunge through the window and give them a non-verbal grilling. "Sorry! Sorry! Sorry! I'll make another one very fast," The man said in English. I would have walked away and told them to forget it, but given my state of hunger and the prospect of hours in a car with no food, I decided swallow my anger and wait. 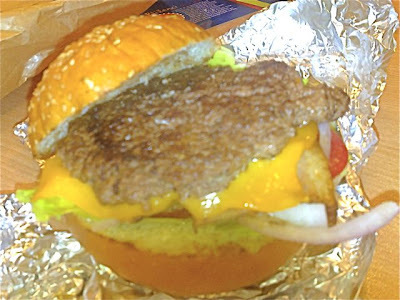 The burger came out very rare, but still edible. For one lunch, I tried the turkey club (99 CZK). 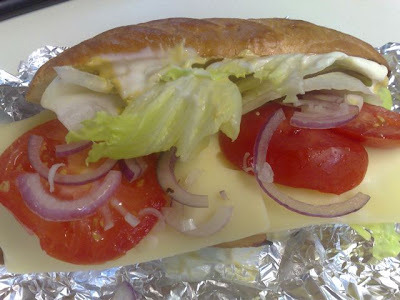 It was fairly ordinary, processed smoked turkey, bacon, Swiss cheese, lettuce, tomato, onion, mayo, and mustard. It was huge. Again, overstuffed with the toppings. It was not possible to eat without making a mess. I saw that the bacon came from a heating tray, rather than being fried on the grill. It was soft, not crunchy. While doing some hard chewing on the roll, I had an epiphany. The roll had just about the same density and consistency of a bagel. It was just stretched into a different shape. Since they make their own bagels, why not make their own rolls with the same dough? I could be wrong, but that's my theory. I didn't think it was a good thing. The size and shape were perfect, but I personally think bagels don't make great sandwich material. That said, my colleague Major Dan liked the bagel sandwich he had for dinner one evening. He was headed off to KFC, and I talked him out of it. I sent him to Bohemia Bagel Express, fearing more for his arteries than he did. 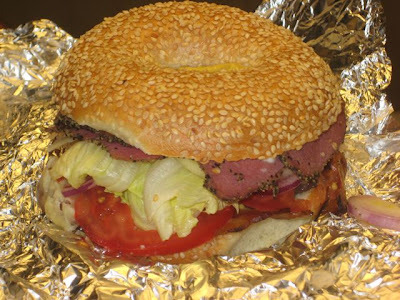 He picked up a hot pastrami bagel (99 CZK). It comes with bacon, lettuce, tomatoes, onions, mustard, mayonnaise, melted Swiss cheese. They call it "pastrami," but it really was more of a processed deli meat. It didn't taste bad, but didn't resemble real pastrami like you'd find in New York. His one negative comment: Too much lettuce. And then there is dessert. 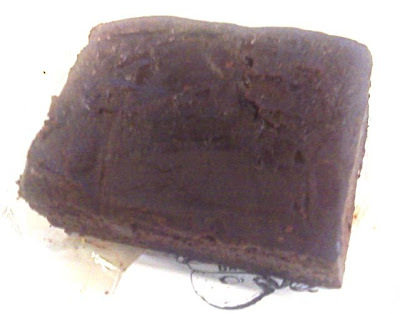 I'm hooked on their brownies (25 CZK). They are very, very fudgy and sweet. They can vary in size. Sometimes, they have been more cake-like than fudge-like. Whatever. I've been eating them for years. 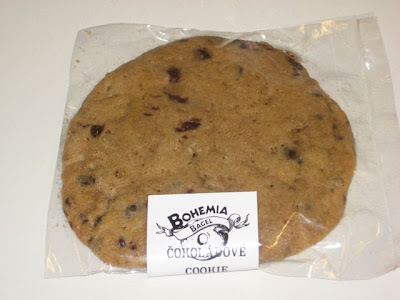 And on the occasion when no brownies are available, I go for their chocolate chip cookies. The one I had the other day was just right -- a little crunch around the edges, and soft in the middle. Maybe it was on the thin side, but still a very satisfying end to a lunch at my desk. 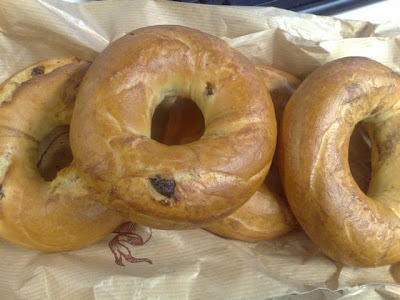 I should mention that I rarely pass up the chance to pick up some cinnamon raison bagels (11 CZK each). I take them home, freeze them, then toast them in the oven as needed. It's nice now that Philedelphia brand creme cheese is available in Prague. But it's not cheap. I found a decent, cheaper alternative. I think it is called Tesco Soft Cheese Natural. Something like that. Being no billionaire, I always like to save a few crowns when I can. Bill Gates? Not so much. He may have served billions and billions in his line of work. But when it comes to a deep understanding of where to get some decent and fast food around Wenceslas Square, I'm your man. Good bagels. Atrocious service. A two-person line invariably means at least a five-minute wait to place your order. I usually buy a few bagels, untoasted, un-cream-cheesed--just some bagels--and it's rare that I get out of there in under 10 minutes. Czech inefficiency at its finest. Another hazard, one that Bohemia Bagel can do little about: the swarms of American college kids and (to a lesser extent) tourists who flock there, brazenly prattling in the loudest, ugliest American English you can imagine. As they would say, eeew. Hi Brewsta. 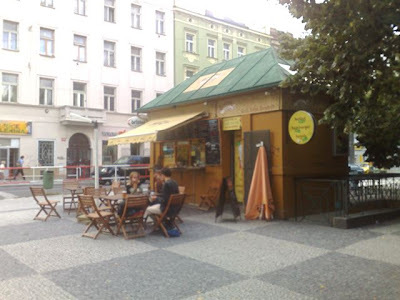 Have you tried Express Sandwich (www.sandwich.cz) at Anglicka, basically around the corner from Bohemia Bagel? There are two reasons why I like this place: their baguettes tend to hit the right spot for me, which is being soft without becoming chewy (I quite like Boulevard’s, for example, but they can get way too crunchy for my tastes), but mainly because they let you choose your own toppings, Subway-style. My only beef with them is that their regular size sandwiches, while pretty generous for the 50-60 CZK price tag, are too small to satisfy my appetite, so I usually have to go for their double versions, which, at double the price, are a tad on the costly side, but still worth the money, I’d say. And thanks for the brilliant blog, it’s the only one I read on a regular basis. Keep it up! 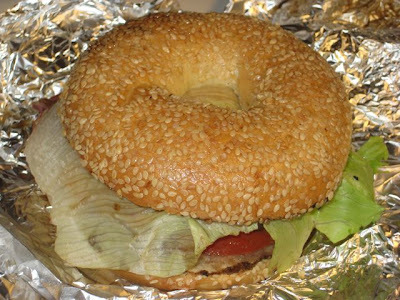 I have not the slightest interest in bagels, but I liked their burger at BBE. Sadly the bacon on both it and in the turkey club I had was, as usual these days in Prague, very very undercooked. I tried out the BB on Masna (near Staromak) and liked it a whole lot more (and the bacon's been cooked crispy the twice I've been there). Mind their quite good turkey club has both cheese and strong mustard which I don't feel go with a club (they're happy to leave them out if you ask, of course) The also have nice fresh salads and very good (hand-cut?) fries, as well as beer on tap there. Oh yeah, and it's a real sit-down cafe; not outside tables as at BBE. I'll be back to both places. Nice post. I agree that some of their sandwiches have too many toppings but luckily I haven't experienced the poor service that others have. Like you, I've been going to BB for years now (and BBE since April '07). My only complaint, actually my wife's, is that BB changed the way they prepare their chicken cesar sandwich a couple of years ago...now it's too dry and the chicken isn't shredded like before. Actually, you can get Philadelphia Cream Cheese pretty cheap. It's sold in Billa for about 28Kč. And I can also recommend you the Expres Sandwich. I was at Anděl and Palladium location and I really enjoy their stuffed sandwiches for fair prices. Now I always go for ham sandwich loaded with vegetables. Simple, but delicious. Yep, it's definitely 65Kč. I've just had one. Sorry about that. Read the internet menu wrong and crossed it up with the price of the tofu burger. I'll fix the post. Will have to give this place a try sometime - quite like Bohemia Bagel, although I still fondly remember the days when they had flavoured coffee rather than just the insipid offerings they have now. I heard today from the guy who was working at Bohemia Bagel Express that the place will be closing permanently on Friday. According to him, business has not been sufficiently good. Nooooooo! Where will I get a steak sandwich during work??? Too bad. > According to him, business has not been sufficiently good .. If their service had been a little quicker and more efficient, would that have made a difference??? I think the bottom line is that it is a bad location. If it had been on the opposite side of Tylovo namesti, near the tram stops, it would have made a big difference.